In my recent studies of PMN Caecilia, I have undertaken a few design exercises using the font. 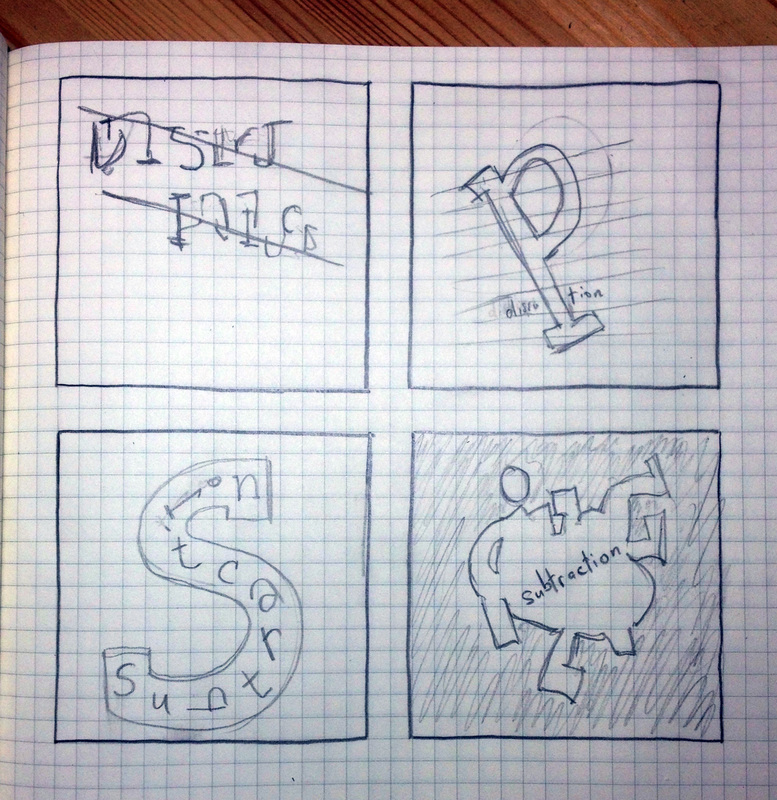 I based the exercises on 2 words: “disruption” and “subtraction”. Here are my rough sketches of my concepts. I used a 14 x 14 grid for each design. Top Left: In this frame I wanted to explore the confusion and miscommunication that disruption can cause. I took the word “disruption” in its original, legible form, and sliced it at a diagonal angle, splitting each letter into two pieces. I shifted the upper letters over to the right so that they almost lined up with the base of the letter to the right. I then lined up and tweaked each letter piece, so it combined and formed a distinct, strange letterform with the piece below it. This results in a word that looks strangely familiar, but is entirely unintelligible. The disruption to the word caused strangeness and confusion. Top Right: I wanted to look at a more pronounced, blatant form of disruption in this frame. I took the letter ‘p’ in the word “disruption and blew it up to a huge size, keeping it in its proper position in the word. I then also disrupted the ‘p’ by breaking it into little pieces and shuffling them up, down, and sideways. Bottom Left: In this frame I placed a bold, positive ‘s’ in the centre of the page, and subtracted the word “subtraction” from it. It plays with positive and negative space, and looks at how more information can be stored in just one letter. Bottom Right: For this frame, I started out with a black background, and subtracting white shapes from it until I had an interesting, pleasing shape. A more and more letters are subtracted, each individual letter loses its form and recognizability. 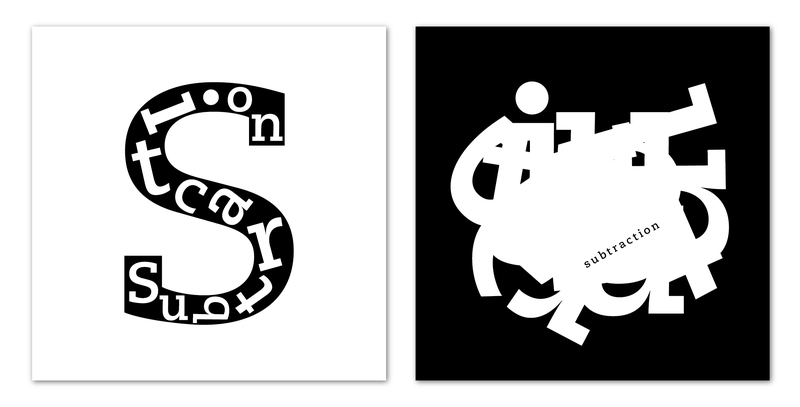 In a bit of meta-subtraction, I then subtracted the word “subtraction” from the white space by adding it in black. And here are the digital results of the sketches. It can often be helpful to sketch your ideas first, and get the rough concepts established. And then if you are better at Illustrator than with a pencil (like me), you’ll be pleasantly surprised when you digitize them and they turn out all right. My pleasure, Tienny. Thanks for reading.